So it took 34 years to integrate the army – all the way to 78! It would be interesting to find out how your Aunt felt about that. You’re absolutely right about context and the awarding of equal pay all those years ago is very interesting. I know very little about the WACs so I’m looking forward to learning. I’ve got to see that movie! I’ve heard of it, but haven’t seen it. I did recently watch an old Cary Grant movie called I was a Male War Bride. It was pretty bad. Grant plays a Frenchman who marries an American WAC, He needed to pretend that he was a woman do that he can get on the ship that is transporting him and his wife to the US. I’ve seen that–with a favorite of mine, Ann Sheridan. Not that Cary Grant is a slouch, but I agree, it was pretty corny. In the US military personnel can retire after 20 years. Aunt Marian had a heart attack or stroke after 19 years–and was forced to take a medical discharge a few months prior to reaching retirement. My understanding is that she was really bummed. That was very tough on her, to say the least . Had I lived back then, I think I would have joined! I’m not sure whether or not I would have–but it definitely gave women opportunities that they hadn’t previously had. It’s interesting how vague they are about what WACs actually do. What are these tasks “more easily done by a woman than a man” anyway? I guess we’re going to find out! There was a lot of political and social resistance to having women in the military at that time–and a lot of angst about what kinds of work women should do . It’s absolutely incredible how much the role of women has changed over the past 70 years. 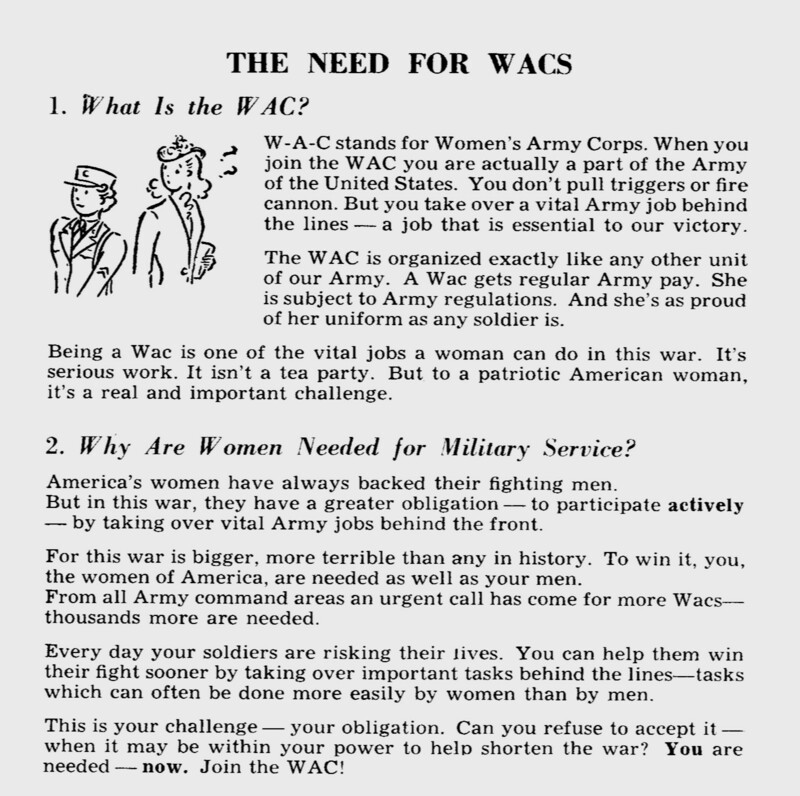 Do you know how many women were part of the WAC? I assume it was only a small percentage of the total US Army. According to the National WWII Museum, the WACs were only a little over 1% of the total personnel in the army during WWII. According to the Women in the Army website, women currently make up 15.7% of the army. In 1978 I went to sign up for the WAC corp and was told they are not part of the regular army, I was excited to know I would have the normal basic training and be a part of the Army as a soldier. Little did I know that before I was to go for my physical I would fall in love and marry my husband who re-enlisted and instead of a soldier I became an Army wife. This is why I know I will feel a kinship with your aunt. What an interesting story. It sounds like everything ended up happening just like it was supposed to happen. God always know what is best for us. I never had any regrets that is for sure. What strikes me more than anything is the call to commitment that was being made in those recruiting ads and posters. No one asks anything of us as citizens any more — not as they did then. My mother was a “Rosie the Riveter,” and like so many women who went to the factories, she was eager to join the war effort, in order to free up the men to fight. My sense of things is that our nation has reached the point of being incapable of mobilizing as they did then: as a nation. One of these days, we’re going to find out. I hope I’m wrong. You bring up a very valid point here! I also have the sense that almost everyone–both men and women–did whatever they could to assist with the war effort during WWII. She was old enough by then to draw SSI. The sad part was there would be no medical insurance for her. Medicare didn’t happen until after her death. I always feel sad that Aunt Marian was forced to leave the military just shy of 20 years for health reasons. 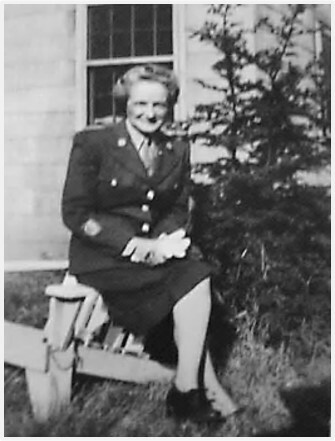 In general she found the WACs so rewarding that it seems like she somehow should have been able to retire from it.